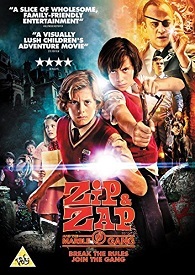 Zip & Zap And The Marble Gang is out on DVD on 26th June and to celebrate we have a great competition for you and 3 copies of the DVD to give away. Troublesome twins Zip & Zap are punished and sent to summer school at Hope, a strict re-education center ran by Falconetti, who forbids all forms of fun. They form the Marble Gang, the children’s Resistance, in order to defy the evil headmaster. Guided by intelligence, bravery and unbreakable faith in friendship, they uncover a mysterious secret hidden deep within the school and end up having the most exciting adventure of their lives.